A progressive argument for repealing the Human Rights Act. Contrary to contemporary panic around human rights repeal, Human Rights - Illusory Freedom puts a progressive case against the Human Rights Act. It describes how human rights arose as a new language for western governments following the collapse in their collective authority in the aftermath of World War 2 and shows how the UK Human Rights Act has presided over a catastrophic loss of freedom, which continued a process which began with the Tory party in the 1970s. 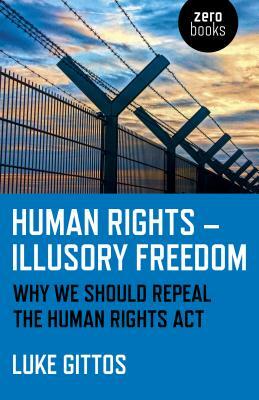 Human Rights - Illusory Freedom makes a positive case for restoring control over our traditional freedoms to the electorate and away from unaccountable Judges in the UK Courts and the European Court of Human Rights. Luke Gittos is a lawyer, writer and is legal editor for Spiked, online-only UK current-affairs magazine. He regularly contributes across broadcast media on issues relating to law and politics, as well as participating in television and radio legal debates, and the Battle of Ideas festival. Gittos recently set up the City of London Appeals Clinic, and he presides over the London Legal Salon.